Pharaoh’s cup bearer forgot all about Joseph. He did not mention him to Pharaoh. But one day, after two whole years had passed by, Pharaoh had two dreams and he was greatly troubled by them. The dreams had all the marks of a God given message. He called his wise men and magicians to hear his dreams and interpret them. 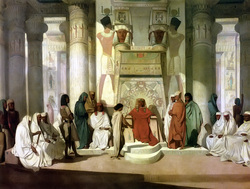 The wise men and the magicians did obeisance to Pharaoh. They were the cleverest men in the kingdom but they could not fathom out the meaning of the dreams. The dreams were so alike yet what had cows and ears of corn in common? It was a mystery. Pharaoh was very disappointed and troubled. Was there anyone who could interpret the dreams for him? It was then that the cup bearer remembered Joseph. So he told Pharaoh about Joseph in prison. Then Pharaoh told Joseph his dreams. 1. What will happen next? Will Joseph be released from prison? 2. Will he be rewarded for interpreting the dreams? 3. Why was Joseph able to interpret Pharaoh’s dreams? 4. What were the dreams? (b) A good guess ?